A serial thief with 64 court appearances for 114 offences has been jailed after he was pursued and caught for stealing bottles of port. Chesterfield magistrates’ court heard on January 16 how Shaun Anton Wragsdale, 38, formerly of Derby Road, Chesterfield, stole five bottles of Coburn’s Port from a Londis store, on Chatsworth Road, Chesterfield, on Boxing Day. Pictured is Shaun Anton Wragsdale, 38, of New Street, Grassmoor, Chesterfield, who has been jailed for 22 weeks after he stole bottles of port and breached two conditional discharges. Prosecuting solicitor Lynn Bickley said: “He went to Londis and had a bag with him and he picked up five bottles of port - worth a total value of £70 - and he put them in a bag and he left the store. “Staff received CCTV and saw the offence and went out in a personal vehicle to drive and find the person responsible. Mrs Bickley added that Wragsdale had tried to escape by jumping over gardens and a river as he dropped the bag. Wragsdale, now of New Street, Grassmoor, Chesterfield, admitted the theft but claimed he had stolen four bottles and not five bottles of port to sell to pay for a debt. He pleaded guilty to the theft which happened on December 26 and he also admitted breaching two conditional discharges for two previous shoplifting offences from a One Stop and a Tesco. Defence solicitor Steve Brint conceded that Wragsdale has 64 court appearances with 114 offences to his name with a 20 year career history of stealing from shops. He added that Wragsdale was properly educated and has qualifications and he did not start on a criminal path until he left school. Wragsdale was introduced to class B drugs and he graduated to class A drugs, according to Mr Brint, and he has taken amphetamines, cocaine and heroin but his drug intake has reduced. Mr Brint said Wragsdale commits offences when things go wrong and his benefits had changed from Employment Support Allowance to Universal Credit and he has been homeless. However, Mr Brint argued that a prison sentence will not work and they have previously never worked for the defendant because he returns to type on his release and becomes trapped in a revolving-door system. 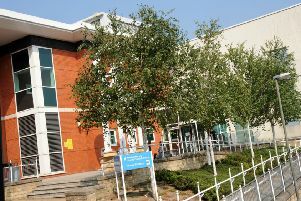 He urged the court to fine Wragsdale, but the probation service outlined how the defendant’s offender manager believes he has reached a point where it would be difficult for him to change. Magistrates sentenced Wragsdale to 22 weeks of custody and ordered him to pay a £115 victim surcharge and £70 compensation.